A BRITISH band have become overnight stars in America despite being virtual unknowns in their own country. Now Radiohead hope their success will spearhead a new wave of British pop in America. Radiohead have taken the country by storm with their year-old single Creep which -was deleted here after selling only 6,000 copies. It burst into the US Billboard charts at number 39 and their debut album, Pablo Honey, is at number 32 in the charts. 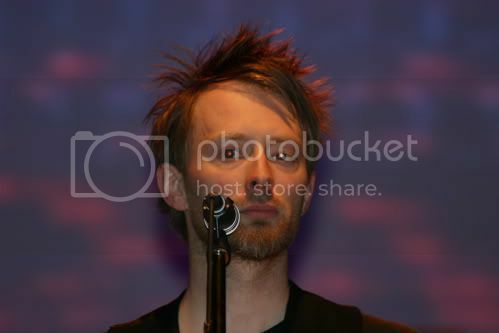 Radiohead, who met at Abingdon School in Oxford and formed the group in 1991, have performed their hit single on America's top-rated Arsenio Hall TV show. Radiohead - singer Thom E. Yorke, guitarists Jonny Greenwood and Ed O'Brien, bassist Colin Greenwood (Jonny's older brother) and drummer Phil Selway - are the first new British act to win mainstream success in America since EMF and Jesus Jones. But they were already established at home. Jonny is as mystified as anyone over the band's sudden success in America but blames British radio for their failure to break through here - Creep did not receive a single play on daytime national radio. It is a gloomy anthem of self-loathing sprinkled with the F-word and a miserable refrain. Jonny said: 'I don't think we can explain what the Americans like about us but they do like classic English angst pop and they seem to find us very English. Creep will be re-released here next month and the band appear at the Reading Festival on 28 August and The Garage in Highbury on 1 September.